Non-alcoholic fatty liver disease (NAFLD) is a major cause of liver morbidity and mortality with no proven effective therapy as of yet. Its prevalence is increasing globally in parallel with obesity and metabolic syndrome pandemic. The endocannabinoid (EC) system has been implicated in the pathogenesis of several diseases, including fatty liver diseases. This system refers to the cannabinoid receptors type 1 (CB1) and type 2 (CB2), with both their endogenous ligands and machinery dedicated to EC synthesis and degradation. There is accumulating evidence on the role CB1 as a key mediator of insulin resistance and liver lipogenesis in both animals and humans. On the other hand, CB2 receptors have been shown to promote inflammation with anti-fibrogenic properties. The pharmacological modulation of the EC system activity for the treatment of metabolic syndrome and NAFLD are promising yet premature. The initial limited success due to deleterious central nervous system side-effects are likely to be bypassed with the use of peripherally restricted drugs. Background/Aim: Bleeding from Gastric Varices (GV) is not only life threatening, but also leads to many hospitalizations, contributes to morbidity and is resource intensive. GV are difficult to diagnose and their treatment can be challenging due to their location and complex structure. 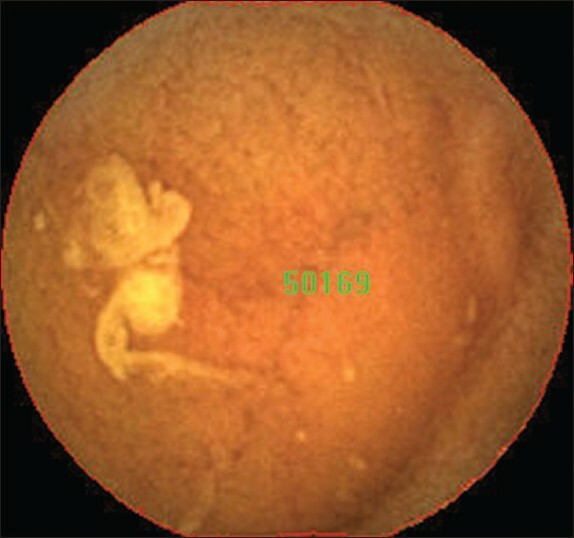 To assess the safety and efficacy of endoscopic gastric fundal variceal gluing using periodic endoscopic injections of N-butyl-2-cyanoacylate (NBCA) and to assess the utility of endoscopic ultrasound (EUS) in assessing for the eradication of GV post-NBCA treatment. 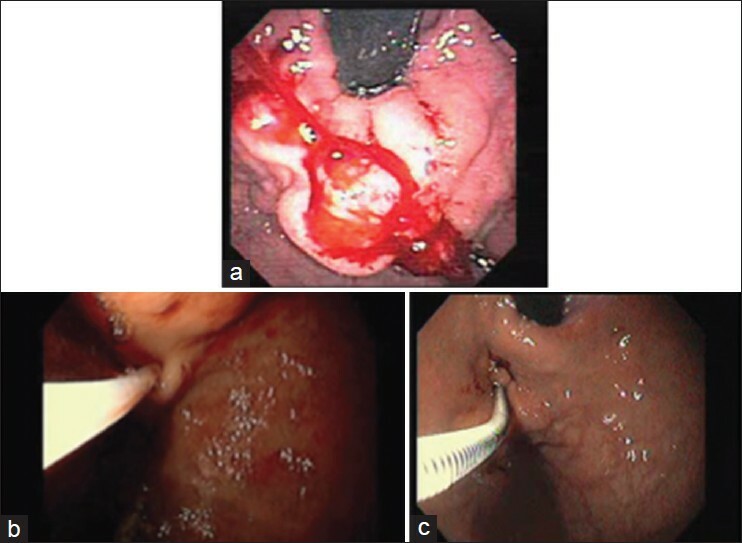 Materials and Methods: Analysis of prospectively collected data of a cohort of patients with GV who underwent periodic endoscopic variceal gluing from 2005 to 2011. Outcomes included success of GV obliteration, incidence of rebleeding, complications from the procedure, and analysis of factors that might predict GV rebleeding. The success of GV eradication was assessed by both EUS and direct endoscopy. Results: The cohort consisted of 29 consecutive patients that had undergone NBCA injection for GV. The mean age was 60.8 years standard deviations (SD 13.3, range 20-81). The average follow-up was 28 months (SD 19.61, range 1-64) and the most common cause for GV was alcoholic liver cirrhosis (34.48%). A total of 91 sessions of NBCA injections were carried out for 29 patients (average of 3.14 sessions/patient, SD 1.79, range 1-8) with a total of 124 injections applied (average of 4.28 injections/patient, SD 3.09, range 1-13). 24 patients were treated for previously documented GV bleeding while five were treated for primary prevention. Overall, 79% of patients were free of rebleeding once three sessions of histoacryl ® injection were completed. None of the patients treated for primary prevention developed bleeding during follow-up. 11 of the 24 patients (46%) with previous bleeding however had rebleeding. 4/11 (36%) patients had GV rebleeding while awaiting scheduled additional NBCA sessions. 19/29 (60%) patients had complete eradication of GV, 11/19 (58%) documented by endoscopic assessment alone, 4/19 (21%) by EUS alone and 4/19 (21%) by both techniques. Two of the 11 (18%) patients that had rebleeding had recurrence of GV bleeding after documented eradication by EUS compared to 5/11 (45%) patients documented eradication by endoscopic assessment and 2/11 (18%) patients that had rebleeding after documented eradication by both modalities. Twenty five patients in total had documented residual GV by EUS (14, 56%), direct endoscopic assessment (18, 72%) or both modalities (9, 36%), two of which developed recurrent bleeding (13%). No immediate or long-term complications of NBCA injection occurred, nor any related endoscopic complications were reported in any of these cases during the time of follow-up. Conclusion: NBCA injection of GV is a safe and successful therapeutic intervention. A minimum of three endoscopic sessions is required to significantly decrease the risk of bleeding/rebleeding. In this small sample of patients, neither EUS nor direct endoscopic assessment was reliable in predicting the recurrence of GV bleeding. Background/Aim: The purpose of this study was to evaluate the clinical significance of visualized area percentage assessment of cleansing score (AAC) and computed assessment of cleansing score (CAC) of these two small bowel cleanliness scores systems for capsule endoscopy (CE). Materials and Methods: The reliability and consistency of the AAC and CAC scores were evaluated by comparing the scores by two examiners (one expert, one without any training in CE). Reliability was determined using the intraclass correlation coefficient (ICC) and consistency was determined using the kappa statistic. Results: The inter-observer agreement was excellent for both the AAC and CAC scores. For AAC, the ICC was 0.791 (95% confidence interval: 0.677-0.868), and for CAC the ICC was 1.000. Using 1.5 as the cutoff, there was no significant difference between AAC and CAC results by the expert examiner (kappa = 0.756, P = 0.000) or the non-expert examiner (kappa = 0.831, P = 0.000). 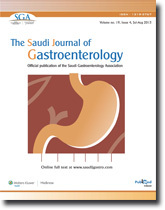 Evaluation of small bowel cleanliness using AAC took 15-30 min, and evaluation using CAC took about 2-3 min. The overall adequacy assessment (OAA) using the AAC was not significantly different between the two examiners (χ2 = 0.586, P = 0.444). There were also no significant differences between the OAA using the AAC and the OAA using the CAC by the expert examiner (χ2 = 1.730, P = 0.188) or the non-expert examiner (χ2 = 1.124, P = 0.289). Conclusion: Both of these scores for assessment of small bowel cleanliness can be useful in clinical practice, but the CAC is simpler to use. Background/Aim: Hepatitis C is a major health concern world-wide and is frequently associated with psychiatric co-morbidity. The most common genotype in Saudi Arabia differs from genotypes prevalent elsewhere and thus we aimed to determine if psychiatric disturbances occur in Saudi patients infected with hepatitis C and whether these symptoms extend to those infected with hepatitis B. Materials and Methods: Data were collected from hepatitis C and hepatitis B patients using the general health questionnaire (GHQ-28) and The Short Form Health Survey (SF-36) questionnaires. Tinnitus patients served as control subjects. The Chi-square test was used to examine the relationship between categorical variables. Continuous variables were compared using the Student's t-test or the Wilcoxon-Mann-Whitney test for skewed data, and correlations were evaluated by calculating Spearman's rho. The odds ratio was used to determine the association between variables and the likelihood of being a psychiatric case. 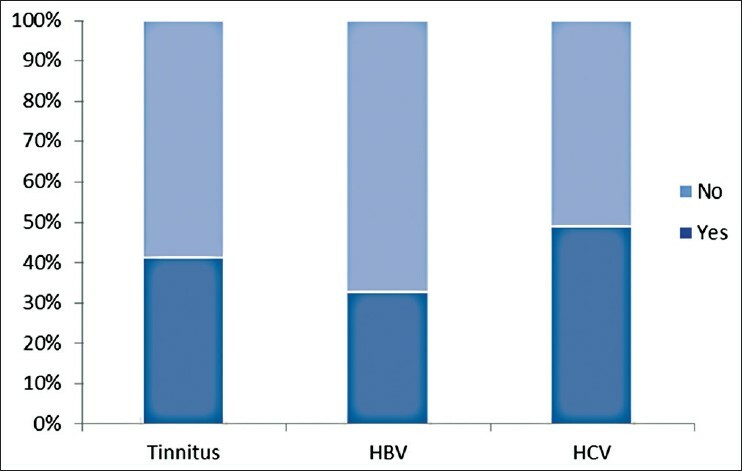 Results: Hepatitis C patients were twice as likely to be labeled as a psychiatric case compared with hepatitis B patients ( P = 0.01). Age and gender were not predictive factors though there was a non-significant tendency toward a higher prevalence of psychiatric cases among females. Hepatitis C patients also scored lower than hepatitis B patients in 3 domains of the SF-36 questionnaire, indicating a greater reduction in quality of life (QoL). Conclusion: We demonstrate an increased incidence of psychiatric symptoms in Saudi Arabian hepatitis C patients compared to hepatitis B patients and controls. This highlights the importance of collaboration between hepatologists and psychiatrists in order to improve the QoL in this patient group. Background/Aim: Multidrug resistance 1 (MDR1) gene encodes for P-glycoprotein (P-gp), a transmembrane efflux pump transferring both exogenous and endogenous substrate from the cells. In the human gastrointestinal tract, P-gp is found in high concentrations on the epithelial cells of the colon and small intestine. It is hypothesized that the expression level of MDR1 gene is related to susceptibility of both forms of inflammatory bowel disease (IBD). The aim of this study was to investigate the association of C3435T Single Nucleotide Polymorphism in IBD patients with/without clinical symptoms in Iranian Azeri Turks. Settings and Design: A total of 116 patients with IBD and 92 healthy subjects were analyzed. Materials and Methods: We investigated the distribution of MDR1 C3435T polymorphism via polymerase chain reaction - Restriction Fragment Length Polymorphism technique. Statistical Analysis Used: All statistical analyses were calculated with the SPSS for Windows 16.0. The Fisher exact test was used to test for departure from Hardy-Weinberg equilibrium of the genotype frequencies ( P > 0.05). Results: The data showed that IBD patient with homozygous variant carrying MDR1 3435 T/T genotype has elevated risk for development of routine IBD clinical symptoms like Abdominal pain ( P = 0.005) and chronic Diarrhea ( P = 0.013) compared with MDR1 3435 C/C homozygotes who has reduced risk for development of IBD symptoms. Conclusions: Our data showed that patients with MDR1 3435 T/T are more susceptible to the development of some routine IBD clinical symptoms ( P < 0.05). This study suggests a protective role for the MDR1 3435 C/C versus MDR1 3435 T/Tgenotype and C versus T allele for the progression of IBD in this cohort. Background / Aim: Balloon tamponade has been widely available in emergency situations of acute variceal bleeding. To lessen the complications of Balloon tamponade, a new special type of stent for exclusive use in acute variceal bleeding has been developed. This study aims to investigate the effectiveness and safety of the new self-expandable metal stents (SEMS) in the initial control of acute variceal bleeding. We also hypothesized that using SEMS can bridge the acute bleeding episode converting endoscopic management by sclerotherapy or band ligation to an elective procedure. Patients and Methods: Twenty patients with acute variceal bleeding were included in the study and 16 of them were allocated to receive stent treatment. Results: Stent deployment was successful in 15 of 16 patients (93.75%). Technical errors were reported in 3 (18.75%) patients. Initial control of variceal bleeding was reported in 14 (out of 16) (87.5%) patients. The mean duration of the procedure was 10 (±6) min. Mortality was reported in 4 (25.0%) patients. Conclusion: SEMS is a safe and effective mean to control acute variceal bleeding. Background/Aim: Gastric cancer (GC) is the fourth most common cancer and the second most common cause of cancer death world-wide after lung cancer. It is a multifactorial disease with the involvement of both genetic and environmental risk factors. Genetic variation in genes encoding cytokines and their receptors, determine the intensity of the inflammatory response, which may contribute to individual differences in severity of outcome of the disease. Tumor necrosis factor alpha (TNF-α) is a potent pro-inflammatory cytokine and acid inhibitor. A bi allelic G to A polymorphism at -308 upstream from the transcription initiation site of the promoter is associated with elevated TNF levels. The present study is aimed at evaluating the role of TNF-α-308 (G → A) gene polymorphism and susceptibility to GC. Subjects and Methods: A case-control study was carried out in 114 GC patients and 229 healthy control subjects. TNF-α genotyping at position-308 (G → A) was carried out by amplification refractory mutation system-polymerase chain reaction (ARMS-PCR) method followed by agarose gel electrophoresis. Results: The distribution of TNF-α genotypes at -308 (G → A) were GG 28.07%, GA 66.67% and AA 5.26% in GC patients and GG 33.19%, GA 55.89% and AA 10.92% in control subjects. The frequencies of alleles G and A were 0.614 and 0.386 in GC patients and 0.611 and 0.389 in control subjects respectively. Conclusion: The study showed no significant difference in the distribution of genotype and allelic frequencies between GC patients and control subject. Cap polyposis (CP) is an under recognized form of non-neoplastic colonic polyps, characterised by the presence of inflammatory polyps with a distinct "cap" of granulation tissue. CP is often seen masquerading as chronic inflammatory bowel disease. The most common symptoms are mucoid diarrhoea, bloody stools, abdominal pain, and tenesmus. 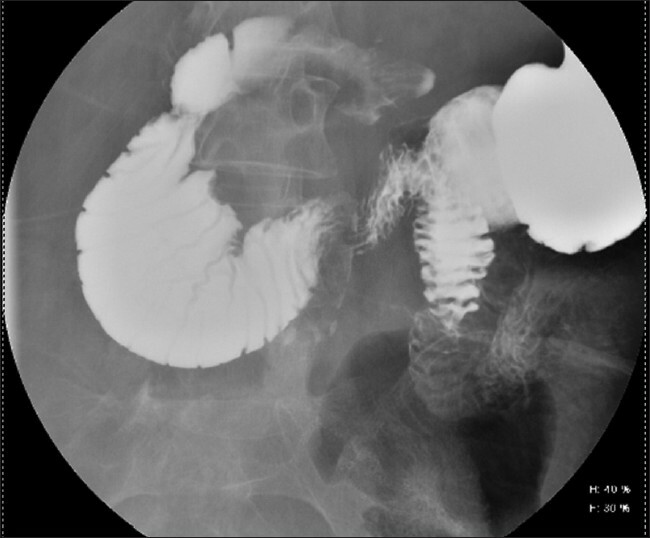 In this case report, we present a patient who was diagnosed with CP during the investigation of unexplained chronic long standing anemia secondary to intermittent rectal bleeding. CP, although rare, should be considered in the differential diagnosis of patients presenting with intermittent rectal bleeding and mucoid diarrhoea.